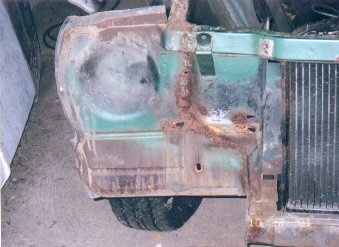 Like I said above, I was encouraged to take the car apart further to look for more rust. The good news is I only found one other rust spot (it was hiding behind some weather strip I should have pulled off earlier). The bad news is I found a really botched repair job from an earlier collision that will require replacement of the radiator support to correct. Hood - Bent and dented. I have another that needs stripped and painted before re-installing it. Since it's not rusty, I'll save it for rust repairs. Grille - Bent and not correct for the car (the grille I took of is for a `69). I have a proper `68 grille I'll install when everything goes back together. Front Bumper - Bent but in good enough condition to have straightened and re-chromed. Fender (driver side) - Very nice. Needs stripped to remove surface rust and a few dings removed. Fender (passenger side) - Very nice except for a section that's missing where the headlight bucket attaches. It's not rusted away but someone took the time to cut this part off of the fender. 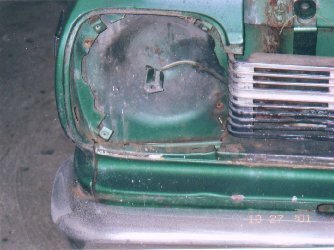 The fender is also from a `69 (it has a Rambler name plate on the side instead of an American one) but is otherwise the same as a `67 or `68. This one also needs stripped to remove some surface rust. This part was replaced earlier in the cars life. Besides being from a `69, it's also blue. Filler panel - Bent, dented, and rusty. I'll try to find another instead of putting the effort into fixing the one I have. This part was previously replaced since it is yellow. Splash shields - Amazingly good condition. They need stripped and the rubber fillers need replaced since they're old and hard. Hood latch - Needs stripped and refinished (not sure if this is painted or has some other black coating on it). Passenger side hood hinge - needs stripped and repainted. Once I had all of this stuff off, I got a good look at the structure of the car and I found out why I had some nasty looking welds on the radiator support. The reason for the nasty welds appear to be from very sloppy collision repair work. It looks to me like when the car was wrecked, some damage was done to the driver side sill that caused the front of it to be pushed over about 1/4 of an inch (maybe a little less than that). 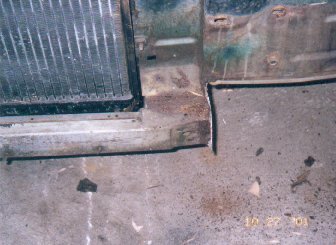 During the repair, the lower section of the radiator support and the hood latch support were replaced (the parts came from a yellow car) and instead of fixing the sill, the radiator support was cut apart on the passenger side and everything shifted over to make up for the difference. It was then welded together with really big nasty welds and I guess called "good enough". Since the structure of the car was changed, the grille and filler panel also had to be bent slightly to conform to the new shape and the hood was difficult to latch properly. 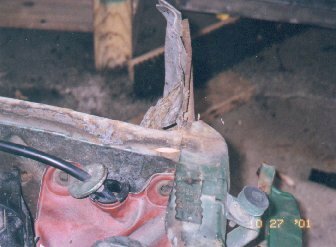 The extensions on the radiator support (these go behind the headlights) were also bent and never straightened. Up Next: Rust and collision repair.